Who doesn’t love dips, especially when they are guit-free and come with health benefits? 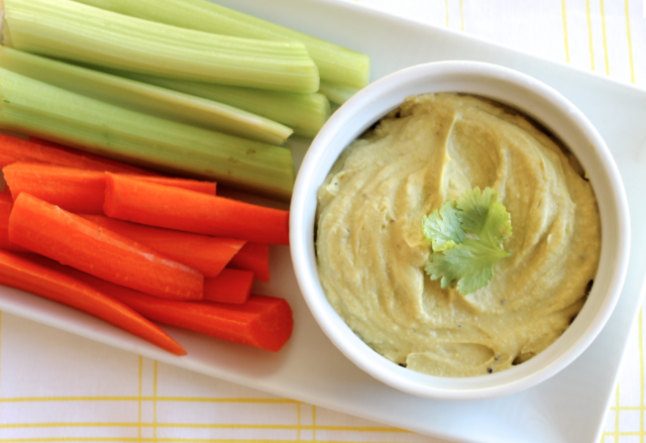 Here is a great hummus recipe for people on the go with busy schedules and little time for preparing an elaborate meal. All you need to do is put all the ingredient in a food processor or mixing bowl and process them until you reach a smooth consistency. The main ingredient, chickpeas (or garbanzo beans), has a delicious nutlike taste and is a great source of protein. Since they are also high in fiber, eating hummus helps prevent constipation and other uncomfortable digestive problems. To all you ladies and gents trying to lose some weight – due to the high fiber content and low glycaemic index (the carbohydrate in them is broken down and digested slowly which helps to control your appetite), chickpeas are excellent for weight loss diets. Flavourful, rich and creamy – avocado does its magic in this recipe along with its high amount of heart-healthy, monounsaturated omega-3 fatty acids. The advantages don’t just stop there – avocados are a good source of vitamin B5, vitamin K and fiber, they are high in magnesium, phosphorus, iron and potassium, containing even more potassium per gram than bananas.